Canadarm 201 sits on display at the Canada Aviation and Space Museum in Ottawa, Canada. This article was updated on May 3 at 5:03 p.m. ET. OTTAWA, Canada – After clocking nearly 100 million miles in orbit, one of the space shuttle program's huge robotic arms was unveiled to the public Thursday (May 2) at its last stop — a museum in the country's capital. The 50-foot (15 meters) Canadarm 201 completed 23 space shuttle flights before embarking on its latest mission as a permanent display at the Canada Aviation and Space Museum in Ottawa. This particular Canadarm was the first to fly in space, riding aboard the second-ever shuttle mission back in November 1981. Canadarm — known by NASA as the shuttle remote manipulator system (SRMS) — also sparked the genesis of the Canadian astronaut program, which hit a high note in March when astronaut Chris Hadfield assumed command of Expedition 35on the International Space Station. "In a sense, it's because of Canadarm that I can even be in space," Hadfield said in a video message from orbit that was played at the change-of-command ceremony. Canadarm 201's success on its maiden flight prompted NASA to extend an invitation for Canadians to join the shuttle program. The first astronaut, Marc Garneau, flew in 1984. "It virtually transformed my dream [to be an astronaut] from the impossible to the possible," said Hadfield, who had been wanting to fly in space since Apollo 11 landed on the moon in 1969. He was the first Canadian to operate the Canadarm in 1995. Originally, Canadarm 201 was supposed to make a temporary stop at the Canadian Space Agency's headquarters near Montreal before going on display in about three to four years. The CSA reversed that decision to make the arm accessible to a larger audience, acting president Gilles Leclerc told SPACE.com. To this day, the Canadians use robotic technology as part of their bartering for space station science and astronaut flights. The longer and stronger Canadarm2 was installed on the orbiting lab in 2001, followed by the robotic Dextre that is periodically testing satellite refueling in orbit. Hadfield returns to Earth later this month, and the next available slot for a Canadian to fly to the station is sometime in 2018, Leclerc said. "We are negotiating with NASA right now to accelerate that," he added. Two other Canadian astronauts are in training at NASA: Jeremy Hansen and David Saint-Jacques. Canadarm 201 on display at the Canada Aviation and Space Museum in Ottawa, Canada. 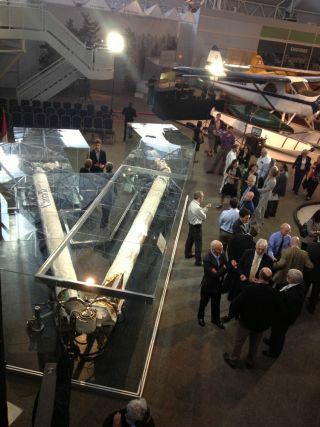 Canadarm 201's unveiling drew a small crowd of former employees from Spar Aerospace Ltd., the company that designed and built the Canadarm. Among those workers was Art Everett, who was responsible for overseeing the copious documentation during the design and build phases..
"We had some of the smartest people in the world. It was just unbelievable," Everett said of Spar, which was later absorbed by MacDonald, Dettwiler and Associates. MDA is still trying to push Canadarm technology forward. Last year, the firm showcased several next-generation Canadarm prototypes that it is hoping customers will buy for satellite refueling, among other uses. MDA also has created robotic arm spinoffs for applications ranging from medicine to mining. As one Canadarm was destroyed in the Challenger explosion in 1986, there are four remaining robotic arms that are now in Canada, the United States and in space. Besides Canadarm 201, one arm is on display at the Smithsonian National Air and Space Museum's Steven F. Udvar-Hazy Center in Virginia, near Washington, D.C, along with the shuttle Discovery. Another arm is at NASA for engineering analysis. The Canadarm on orbit was converted as part of an orbital boom sensor system (OBSS) to create a 50-foot arm extension capable of scanning underneath the space shuttle for damaged thermal-protection tiles. The conversion took place after a breach in Columbia's wing led to the shuttle's demise in 2003. The OBSS was left at the space station after the shuttle program's retirement in 2011. Editor's Note: This article was corrected to reflect the fact that Canadarm flew on 23 space shuttle flights, not 27, as was originally stated.